Dave's Gourmet Scorpion Pepper Hot Sauce combines the original heat of Dave's Gourmet Insanity Sauce with the mind-bending heat of the Scorpion Pepper. When sauces are this hot, flavor is sometimes an issue, but not for Dave! 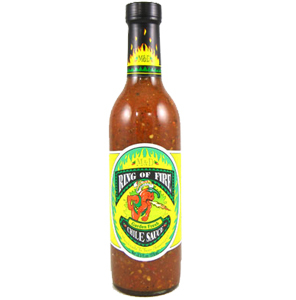 After feeling the searing heat of the Scorpion pepper, enjoy the wonderful flavor of this sauce long after the burn! Meets heat expectation and taste. very good hot-sauce. Dave's Gourmet Scorpion Pepper Sauce is the best, and hottest, sauce that I currently own. In contrast to several reviews that I have read of this sauce, my own particular bottle is much, MUCH hotter than Dave's Gourmet Ghost Pepper Sauce, which I also own, and was my previous go-to bottle for that lovely, searing jolt. More importantly, though, in my opinion this sauce has a considerably better flavor than Dave's Ghost Pepper Sauce. The Scorpion Pepper Sauce has a delicious fresh pepper taste which cuts through the heat, even when used to spice up other dishes. Yesterday, I used it to heat up a Pomodoro sauce, and the pepper flavor added a fresh, clear note to the pasta. In contrast, I have also used Dave's Ghost Pepper Sauce for the same dish, but this resulted in an unpleasant bitter taste (the heat was still worth it, though!). I suspect that both the better taste and the variability in heat levels between individual bottles of the Scorpion Pepper Sauce might be due to the fact that this sauce uses no extracts or other flavoring ingredients and, as such, might be dependent on the heat of the peppers that happen to be in the bottle you buy. 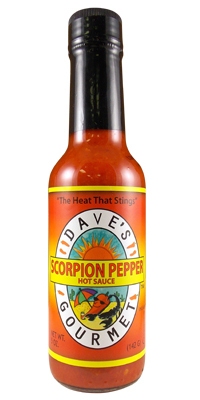 No matter what, though, I would imagine that any hot sauce lover would be very happy with Dave's Scorpion Pepper Sauce. I know I am! Just received my first bottle, put on my bio-hazard suit, and opened 'er up. Started out cautiously but was soon putting big globs of it on potato chips. The taste is fantastic, BUT I was expecting something much hotter. Dave's Ghost Pepper brew stomps all over this sauce as far as heat goes. (and the Ghost Pepper is a great sauce also). Is the heat of the scorpion pepper just a myth? 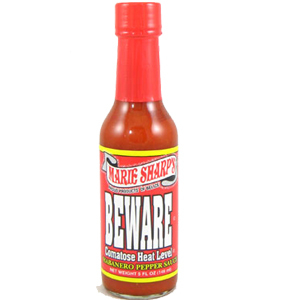 Marie Sharp's Beware Comatose Hot Sauce 5 fl.oz.